Photonics R&D in the form of sensing technologies for manufacturing, medicine, and environmental monitoring will be a driver for the next generation of job creation, three successful entrepreneurs in a panel presented by SPIE told a U.S. House of Representatives caucus last week. Panelists shared insights on successful commercialization of new sensing products; from left, Alan Kersey of CiDRA, Robert Lieberman of Intelligent Optical Systems, Timothy Day of Daylight Solutions, and William Yang of BaySpec. Sensing technologies used in manufacturing, medical diagnostics, and chemical detection for security and environment hold potential for new applications with accompanying creation of new jobs. 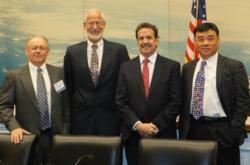 Case studies from photonics innovators who have made it through the R&D “valley of death” to bring new sensing products to market highlighted a briefing presented last week by SPIE, the international society for optics and photonics, in conjunction with the House Research & Development Caucus. Alan Kersey, Vice President Strategy, Mergers & Acquisitions, of CiDRA, on “Enabling innovation in sensor technology: a company case study.” Kersey’s talk described the model CiDRA uses to effectively take early stage R&D into end-user applications ― typically in high-value industrial sensing for natural resources processing. Sensing technologies, used in advanced manufacturing, medical diagnostics, and chemical detection for security and environment, hold potential for new applications with accompanying creation of new jobs. "Today's speakers exemplified the entrepreneurial spirit that permeates the rapidly growing field of optical sensing and monitoring,” said panel moderator Robert Lieberman, President of Intelligent Optical Systems. “From medicine to defense, and from the sea floor to outer space, photonic devices are providing the images and information that enable computers and people to better understand our world. The rapid progress in this field is resulting in a profusion of new technologies, and new jobs." About SPIE: SPIE is the international society for optics and photonics, a not-for-profit organization founded in 1955 to advance light-based technologies. The Society serves nearly 225,000 constituents from approximately 150 countries, offering conferences, continuing education, books, journals, and a digital library in support of interdisciplinary information exchange, professional growth, and patent precedent. SPIE provided over $2.5 million in support of education and outreach programs in 2011.